Do you want to charge the castle walls and fight for honor and glory? Get suited up, and grab your weapon because Zhanshi free slot game presents you with gorgeous graphics and impressive wins worth fighting for. Zhanshi promises endless battles with great reels of excitement. The game allows you to play as a Mandarin warrior and fight for rewarding prizes. This war game has no foolproof strategy, and your defeat relies on luck. The best part of this part is that you don’t have to fight for Zhanshi free slot game’s great payouts. You are guaranteed of two free wards features, which can award you up 25 free games. You can play Zhanshi free slot game on your smartphone and tablet device just like our wide range of Internet Free Slots. Furthermore, the gameplay is just akin to the Instant Play and Download version. The game starts when you hit 3 warrior symbols, which sends you into a Free Games pre-game feature that allows you to pick one of the 3 warriors. You should choose wisely because the three warriors have 15, 20, or 25 games. All Zhanshi free games triple their prizes, which gives a bigger winning potential. Additionally, whenever the free games are over, you can revert back to them any time, or play another Free Games feature. If you hit 3 Temple symbols, you get 10 double prized free games. However, that is just the beginning of your potential big rewards. With a jackpot that has a reset amount of $1,000 and a top prize that is 30,000x your bet line, the Zhanshi slot might be your new favorite online slot game. You should establish your most suitable betting range before hitting the battlefield. You can use the “Bet” arrows to set the coin size that ranges from 0.2-5. You can also use the “Lines” to establish your desired number of bet lines, and the “Spin” wheel to move the reels. Using the “Autoplay” button, you can automatically turn the reels with any disruption. With the help the 3 gears, you can use “Speed” to set the reels’ speed. The warrior is the game’s Wild symbol, and it can make wins on its own, and substitute for all other game symbols apart from scatter. Being the Scatter, the Temple can make scatter wins if you land at least 3 of them on the reels. Furthermore, the total bet is multiplied by all scatter wins. 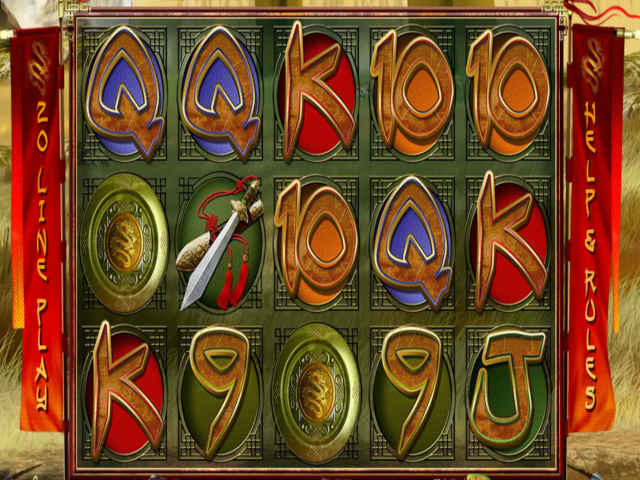 Zhanshi online slot game is simply amazing with its animations, themes, and graphics that appear when the reels spin. This is a highly entertaining game as it features a brave Chinese warrior. It also has amazing rewards, and the progressive jackpot keeps growing while the players enjoy the game.